Posted February 4th, 2017 by Admin & filed under Flue Lining. How effectively fireplaces work and how to best build are core issues that have created a lot of fuss among homeowners. Chimney designs have evolved with time and the number of chimney sweeping professionals has also increased tremendously. Keeping chimneys in the best condition has never been an easy task for many people. Now and then, you will come across a few people in your locality looking for the most reliable chimney lining company and professionals. Most of the problems linked to fireplaces can be solved through installing the best chimney lining. Benefits of flue lining are extensive and it is advisable at all times to ensure your chimney is fitted with the best lining in the market. For your chimney to operate perfectly, you have to make sure that it is smooth, warm and straight. An irregular and rough or damp flue will not guarantee smooth and fast emission of gases. Cooler gases will mean insufficient chimney suction as well as slow and poor flue gas speed. Here are a few things as to why many experts advocate for chimney lining to solve some of the common chimney problems. With a well fitted flue lining, chimney fires will become a thing of the past. Chimney fires are quite common in many homes especially where the occupants are not observant and fail to inspect their flue on regular basis. Unlined chimney can easily cause substantial damage and great destruction of property. Besides preventing fires, flue relining also protects houses against excessive heat into the desired rooms. Many chimney problems are as a result of installation of irregular chimneys. Using a flue liner will decrease your chimney volume. High temperatures will be seamlessly maintained and flue emissions will travel faster into the atmosphere. A well installed chimney flue will guarantee a consistent draft. It is also advisable to insulate your flue lining to increase chimney temperatures. Through flue relining, you will also ensure less soot being amassed on your chimney. Hence, it will be easy to clean and sweep your flue and keep it in the best condition. Many times, a damp and cold flue will produce a poor draft which will slow down the emission of fumes into the atmosphere. Thus why, you hear many people complaining about excessive smoke in their homes when using their fireplaces. Fortunately, installing a new chimney lining will solve this problem. You should also repair the brickwork and mortar that may have been eaten away by Sulphur and reduce emission of dangerous gases into your house. An effective chimney lining is imperative for any homeowner who owns a fireplace. Chimney liners come in diverse design and quality, and it is not easy to pick the best. It is thus wise to seek help and consult with experts before you decide to reline your flue. The common types of chimney liners include metal chimney liners, cast-in-place chimney liners, and clay tiles among others. If you are out there looking for the best chimney lining London services, visit a reputed firm. Go for one that holds unmatched experience in the field and guarantees professionalism. Posted June 13th, 2016 by Admin & filed under Flue Lining. Having a beautiful looking chimney in your neighbourhood doesn’t mean that it will continue forever. With the passage of time, not only the beauty of chimney is impaired, but it starts showing signs of ageing and developing issues. The lack of maintenance can lead to hazardous and possibly dangerous issues if left unattended. Chimney relining services should not be ignored, or your house and the people living in it will be affected. The deterioration and slow fall of brickwork and mason besides the cracking of the tiles results into severe risks, as the toxic levels would increase in atmosphere of your house. Gases will begin to leak and start polluting. If this happens in your home, you have to deal with it and it can be costly if you leave it to when major issues are there. Expert restoration of complete chimney either through the way with strong re-lining, using high graded material is a great way of ensuring your chimney long term health. Old and worn out chimneys need plenty of attention and the quality of the liner will matter as well as analysing and measuring the inner dimensions of flue. The choice between rigid and more flexible liner depends on the situation and the extent of the problems we encounter. The chimney relining process requires careful thoughts, and precise measurement. We are one of the most (if not the most) trusted professional chimney relining London based service, with hundreds of repairs completed over the years, high customer satisfaction and a huge amount of customer referrals to their friends and family. We must be doing something right! We will help you with the repairs and reconstruction of your chimney and the work will be carried out to the highest standards. Is the chimney relining service registered with a major training and certification organisation? Are they insured, what for and to what level? Are they experienced at flue relining? Without appropriate chimney lining, the probability of occurrence of chimney fire increases, and this might even stop the burning stove to perform effective heating functions. Old flue linings are not really up to modern standards. The new contemporary flue linings are designed for efficiency and these can easily put off the smoke retracting from the upper part of chimney. It is more flexible, and practical resolution for long lasting chimney functioning. Another significant consideration while choosing chimney liner is to give look at pipe dimension. Relining or is a tough thing to do on your own; and this is where you can ask for the professional advice. Insulating the chimney liner completely will keep chimney cleaner for longer duration of time. Chimney lining London can solve all your Chimney issues, make sure you insurance is valid and your heating optimum. Posted February 19th, 2016 by Benjamin & filed under Flue Lining. If you own a solid fuel chimney or are interested in acquiring one for your family home, then Chimney Lining London are the people to call. You’ll be surprised to know if you didn’t already, that the chimney sweeping and installation industry is still going strong, and thanks to the advances of 21st Century technology, the procedure has never been more safe, clean, or as efficient. Established in 1984, we are a family friendly business that has been serving London and the surrounding areas for over 30 years. 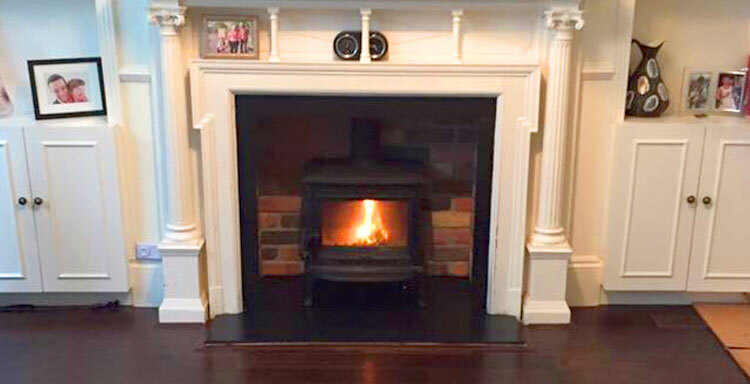 Each member of our staff is an expertly trained specialist in chimney flue systems, stoves, and fireplaces who can see to any stove or fireplace installation, chimney lining, and flue lining job, as well as any additional servicing you may require. We will not only help in the setup and construction of your new chimney, we also provide a full aftercare service as well, dealing in top to bottom sweeps, repairs to the chimney and relining it, should it become worn by natural causes. All of which will fall under one job for simplicity’s sake, and better peace of mind for you. Certified and accredited by the HETAS (Heating Equipment Testing and Approval Scheme) and The Guild of Master Chimney Sweeps, our fully insured and certified company strives to supply our customers with professional levels of workmanship on any job we are hired to do. Should that job be supplying and installing a flexible or rigid insulated steel flue system, servicing an existing brick or steel chimney, or installing a fireplace or stove from scratch, it is guaranteed that any job we do will be done correctly and thoroughly, every time. So if you are interested in acquiring your own solid fuel chimney, call us, the city’s premier chimney lining company. Posted January 4th, 2016 by Benjamin & filed under Chimney Sweeping, Flue Lining. In today’s world of modern appliances and conveniences, you would imagine that chimney based industries would all be long dissolved, however, this could be further from the truth: now it’s even easier, cleaner and more efficient to do the job than ever before, and Chimney Lining London are the people to call if a solid fuel furnace or chimney is what your home needs. Our family friendly business has been serving the people of London and the surrounding areas proudly since 1984; that’s over 30 years of experience and growing. Each of our staff members is an expertly trained specialist in all matters to do with chimney flue systems, stoves, and fireplaces who can assist you with any type of chimney related job, be it chimney lining, flue lining, installations, or otherwise. Our services don’t end once the construction of your new chimney is completed, we will also provide you with a full aftercare service should you need us again to sweep the chimney, repair it in case of weather damage, or realign if it falls victim to strong winds. All of these services and more come in a nice single-job bundle, so there’s no need to fret about expenses or multi-day scheduling disruptions. We take great pride in stating that our company is Certified and accredited by the HETAS (Heating Equipment Testing and Approval Scheme) and The Guild of Master Chimney Sweeps, and that we as a fully insured and certified company make it our top priority to supply our customers with only the highest standards of professionalism and workmanship on every job we participate in. No matter what the job may be, be it installing a stove or fireplace from scratch, to fitting a new steel flue system to an existing chimney, every job can and will be handled correctly every time. So remember the next time you think about your chimney, call Chimney Lining London, the city’s finest chimney lining company. Posted November 26th, 2015 by Admin & filed under Flue Lining. If you own a solid fuel chimney or are interested in acquiring one for your family home, then Chimney Lining London are the people to call. You’ll be surprised to know if you hadn’t already, that the chimney sweeping and installation industry is still going strong, and thanks to the advances of 21st Century technology, the procedure has never been more safe, clean, or as efficient. We will not only help in the set up and construction of your new chimney, we also provide a full aftercare service as well, dealing in top to bottom sweeps, repairs to the chimney and relining it should it become worn by natural causes. All of which will fall under one unanimous job for simplicity’s sake, and better piece of mind for you. Certified and accredited by the HETAS (Heating Equipment Testing and Approval Scheme) and The Guild of Master Chimney Sweeps, our fully insured and certified company strives to supply our customers with professional levels of workmanship on any job we are hired to do. Should that job be supplying and installing a flexible or rigid insulated steel flue system, servicing an existing brick or steel chimney, or installing a fireplace or stove from scratch, it is guaranteed that any job we do will be done correctly and thoroughly every time. So if you are interested in acquiring your own solid fuel chimney, call upon us, the city’s premier chimney lining company. Does your chimney need repairing? What exactly is a ‘broken’ chimney? Chimneys are lined – the flue lining. This lining creates a clear path for the gas and smoke, and protects the fabric of the chimney from the products of combustion. In older houses this lining was usually clay. This weakens and breaks down after a few decades of use, particularly where a chimney hasn’t been cleaned regularly. Modern flue lining come in different materials. A flexible steel liner can be lowered down the chimney to the hearth. Rigid steel liners are assembled in sections in the chimney. A ceramic coating can be sprayed on the inside of the chimney until an adequate layer of lining is created. Each of these techniques has its pros and cons, price tags and level of guarantee for the future. A chimney sweep will be able to advise you on the best solution for your property. How do I know if I need flue relining? Flue liners are only needed if a chimney is defective – especially where smoke or fumes are leaking into the property. In this instance tar will build up inside the flue, often leading to staining on the chimney and house walls (inside and out). As the tar and creosote is highly flammable their presence can result in chimney fires – which won’t be covered by insurance if the chimney has not been regularly swept. There can be a risk of carbon monoxide poisoning through leaking gas, so flue relining is essential. If you are installing a wood burning stove you might also need a flue liner to improve the efficiency of your chimney. To operate legally a stove needs a 65% efficiency rating at least. If the stove does not burn efficiently the tar produced by the low intensity burning will cause the problems to the chimney described above. Contact a HETAs registered sweep and they will be able to advise you about chimney lining. Lots of people! The industry has been on the up (in more ways than one) in recent years. Far from a dying trade, the business is expanding – both in terms of there being ever more sweeps and because the role of the sweep has grown. Chimneys still have to be swept, but most sweeps are now finding themselves fitting stoves and fireplaces, installing flues or chimney lining – and there’s still plenty of wedding work. With all the new responsibilities comes a lot of training – and an influx of new trainees. Chimney Sweeps now have to be HETAS accredited so they can install and maintain stoves and appliances and sign off on their own work. Training centres have been set up with all sorts of appliances for aspiring sweeps to tinker with. They also have to practice flue lining with the different materials available. There’s steel (flexible and rigid, twin-walled and single-walled) clay tiles, ceramic coatings… They all require very different installation methods, and your trained sweep needs the knowledge to be able recommend the best type for any given chimney. And obviously sweeps need to be experts at sweeping and checking your chimney. A trained sweep can tell from the soot if you burn coal, wood or oil. More importantly, they can tell from inspecting your chimney if it is structurally sound and not leaking smoke or gasses into the house. The strength of a chimney sweep’s inspection is so great that insurance companies won’t pay out on chimney fires if a chimney hasn’t been recently swept and checked by a sweep. Which a high demand for their services and such a varied role for today’s chimney sweep, the tools of the trade have become more sophisticated to save time while doing a good job. Sweeps use thousands of pounds-worth of CCTV equipment to inspect chimneys for blockages and damage. Industrial vacuums clear the soot from the chimney before it can make a mess of a client’s living room. The industry has modernized, and continues to grow. For chimney sweeps, the sky’s the limit. Posted July 16th, 2015 by Admin & filed under Flue Lining. Your chimney must be of an adequate height and construction for the appliance it is connected to. Everything must be absolutely safe and structurally sound. Chimneys also have to be efficient. Firstly because an inefficient chimney will cost more – you need to burn more fuel if you want to be warm enough when the chimney doesn’t draw the fire properly. Secondly, and more importantly, inefficient chimneys deteriorate. They get clogged and blocked with tar and products of combustion. This can build up over time and break down the fabric of the flue and chimney. If it gets to the stage where material seeps through the brickwork and stains the outside of the house, or even the interior walls (the wallpaper can also start peeling off), then the chimney needs repairing. A more lasting ‘repair’ is flue relining. The chimney lining can be replaced with a clay, ceramic or metal liner that provides an efficient channel for flue gasses and protects the chimney from the tar and other materials being drawn up. These liners can have guarantees of 15-25 years, depending on what you choose. In some circumstances the chimney is also filled with material to insulate the lining being installed. Depending on conditions at your property, cold air in the flue around the liner can cause condensation to build up and clog the liner with damp tar and other material. In the other extreme, insulation will protect the chimney walls from a hot flue liner. Embers are the experts when it comes to chimney relining. We supply at fit all types of liner and we’d be happy to inspect your property and advise you of the best options for your home and appliance. If you want to read more about flue lining then take a look at our website. You might not be able to tell from looking, but chimneys aren’t just brick. They are lined to make sure the flue, the space inside, works properly. Traditionally this was done with clay tiles. Now there are several options for lining, and quite often the original lining on older houses needs replacing. If you are unsure whether your chimney needs lining or relining, the answer depends on your circumstances. If your chimney is structurally sound then you probably don’t need to have it relined. But if tar and combustion products are seeping through the mortar and staining walls (or worse, leaking carbon monoxide into the house) then the chimney needs repairing and a lining should be fitted. Linings are also highly recommended if you are installing a wood burning appliance. If your chimney is not efficient enough to take up the flue gasses from a wood burning stove then it is a legal requirement that the flue be relined (65% efficiency or above is mandatory). But in any case the appliance will operate more efficiently (and economically) if the chimney is lined. If you are concerned then the best solution is to ask a chimneysweep to take a look at your chimney. They will make sure it is professionally swept and perform a smoke test to check the flue’s integrity. Embers provide chimney relining London. We specialize in supplying and fitting flue liners and are accredited by HETAS and the Guild of Master Chimney Sweeps. We will gladly come and inspect your chimney and advise on flue lining. Generally you will need a 6” liner for a wood burning stove. These can be of the clay type, a ceramic spray-on lining or a steel liner – which can be flexible, rigid and twin walled. These all have their pros and cons for cost and features, and we will take you through the best solution for your property. If you would like to get in contact or find out more about us then click here. Posted March 26th, 2015 by Admin & filed under Flue Lining. If you find that smoke is coming out of your fireplace and into the room there could be several reasons why this is happening. * Your chimney may need sweeping if this has not been done for a while. * Similarly, if your chimney hasn’t been inspected for a few years it could well have become blocked with debris, preventing smoke from escaping to the atmosphere. * More seriously there could be damage to the flue that is reducing the updraft and allowing smoke to escape through the chimney lining and into the walls – or to other rooms in the house. There might even be a risk of carbon monoxide poisoning if this is the case. * If your chimney is not efficient enough it will not be able to draw up the smoke and combustion gasses properly. The air inside the flue has to be warm enough to maintain the pressure difference from the air outside (the lighter, warmer air in the chimney is carried higher than the colder air outdoors). Chimney relining is a very effective way of dealing with these efficiency issues and blockages/damage. A properly insulated flue lining prevents seepage of smoke or tar into the chimney’s fabric. The flue stays hot, so exhaust from the fire is always carried up efficiently and quickly. Flue re-lining also ensures that there is a clear run from the fire to the chimney top, aiding the route of the flue gasses and combustion products to the atmosphere. There are various types of flue lining: flexible and rigid steel, ceramic, clay… We will carry out a thorough inspection of your property to determine the best method of flue re-lining. And we’re always happy to discuss the options with you.